Made in America is a political opera cycle and one's appreciation for the work rests upon one's willingness to accept the opera stage as a bully pulpit. 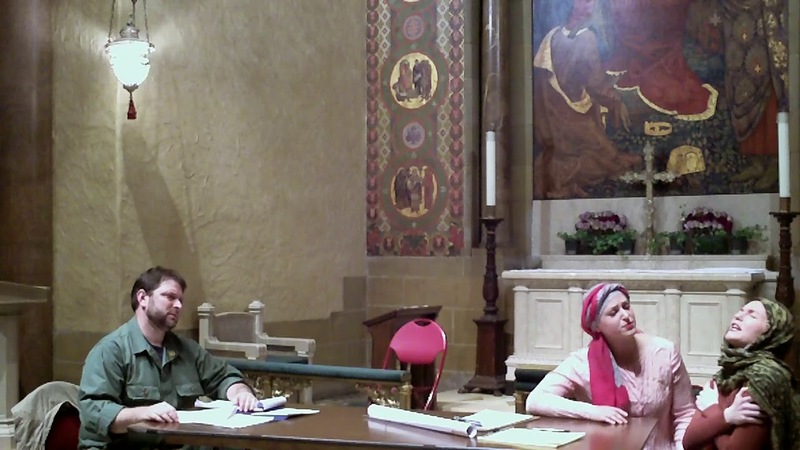 The event--"Episode1: The Interview"-- was a co-production of Sonya Rice of OperaOggiNY and Diane Kaldany of the St. Bart's Episcopal Peace Fellowship. Polymath Thomas Lawrence Toscano, Artistic Director and Founder of OperaOGGINY served as composer, conductor and librettist. Last night we witnessed the first of a series of one-act events, each with a theme: Episode 2 will tackle Big Pharma; Episode 3, fracking; Episode 4, police shootings of young black males; Episode 5, the plight of veterans. "Episode I: The Interview" has the achievement of peace in Israel as its theme. The three characters are Alzubra, an American woman married to a Muslim man, Anat, an Israeli mother, and an Army Public Affairs Officer who has been assigned to question the women the better to understand the organization they have formed called MuJeLif--Muslim and Jewish Women for Life. The women tell their stories of how they each lost two children in two very different tragedies, both laid at the doorstep of the good old USA which has provided arms to Israel and drones that kill innocent children. Mostly due to the greater intelligibility of lower voices, it was easier to understand the unofficial sympathy of the PAO officer, believably acted and sung by Ben Spierman and the sad story of Alzubra, sung by Perri Sussman whose rich mezzo was a highlight of the evening. Soprano Lyssandra Stephenson has a fine voice and was convincing in her support of Alzubra who seemed to be suffering more; but her high-lying vocal lines did not permit much understanding of her story. Overall, we liked the dramatic and vocal aspects of the brief evening and found the piano music, performed by Alessandro Simone, to be interesting for the most part, often given a Middle-Eastern slant, and closely linked to the emotions being expressed. Like most contemporary opera writing, the vocal lines were not particularly memorable, the problem lying largely in the sound and rhythm of the English language; Broadway writers, however shallow, seem to have the knack that serious composers do not. The libretto was just not very singable. That being said, we loved the duets between the two women whose voices rose in affecting harmonies. The prayers the women offered seemed of a more musical nature than the rest of the singing which might just as well have been spoken. Although the tale is a tragic one, the ending is hopeful. The two women sang a lovely duet that scans and rhymes! Never underestimate the power of women to effect change. (Nor the power of men to create the problems in the first place.) The final scene was of the meeting of MuJeLif and we spied a group of women off to the side wearing head scarves, presumably members of MuJeLif. We were all set for a final chorus but none came. Perhaps Maestro Toscano would consider adding one! The subject is of inestimable worth but one that lends itself more to journalism or theater. We remain unconvinced that opera is a suitable vehicle to move peoples' beliefs or to promote activism. Perhaps Giuseppi Verdi's massive choruses about liberty motivated the Italian people in the Risorgimento. But that was another time and another country. Today we go to the opera to be entertained!